If you’re struggling to make sense of Spanish verb conjugation (it doesn’t really exist in English!) why not consider my on-line course which explains the mechanics using fun animation? You will benefit from this course if Spanish is the first time you have studied another language. Check out the sample lecture here, and if you’re interested in the full course (£37) you can get that at Bristol Spanish on Teachable. Essential Spanish Grammar, Intermediate Part 1. It is available as an MP3 download or CD. This CD takes a rather traditional approach for the modern day – using grammar drills to teach/reinforce grammar points. I found it very effective and I think it could be used by both the independent learner as well as the teacher in the classroom. The strategy is simple – grammar points are illustrated within the context of a real-life phrase, and read aloud on the CD in a question-answer format. Following an example, read at native speaker speed, there is then time for the learner to speak the answer to a question in the pause. The answer is provided shortly afterwards. For example, drill set 1 deals with direct object pronouns: ¿Compraste la ginebra? No, la voy a comprar.The tone is straight-faced throughout, which made it almost funny at times, after so much repetition. 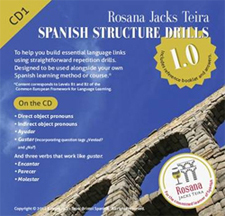 The CD should certainly help build essential language and could be practised in many situations, although to be able to respond to the questions yourself I would advise sitting down and reading the accompanying booklet. The transcript booklet is helpful and well-presented on the whole. This is a traditional, sometimes forgotten approach to learning language that has its benefits, and can be used on the move. The drills do demand your attention, so it is possibly best not to multi-task too much at the same time. Great fun! AP, St Andrews, Bristol. See more student comments at Amazon UK.